Greed - God's Children Should Not Be Greedy, Are You? Home study am i sinning Greed – God’s Children Should Not Be Greedy, Are You? Greed – God’s Children Should Not Be Greedy, Are You? Greed leads to destruction. If you love and serve God, be satisfied with what you have. And he said to them, Take heed, and beware of every form of greed: for a man’s life does not consist of the abundance of the things which he possesses [Luke 12:15 (RKJNT)]. Did you know that a greedy person is the same as an idol worshipper? 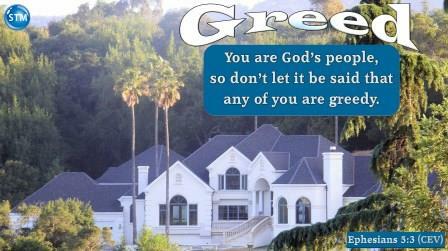 Yes, greedy people make things their god! Jesus warned against this. So, make it a priority to understand greed; this study can help. Greed is a form of coveting. Covetousness is a very grave sin; indeed, so heinous is it that the Scriptures class it among the very gravest and grossest crimes (Ephesians 5:3). In Colossians 3:5 it is “idolatry,” while in 1 Corinthians 6:10 it is set forth as excluding a man from heaven1. When people constantly want more than they have, it destroys them and others. So are the ways of every one that is greedy of gain; which taketh away the life of the owners thereof [Proverbs 1:19 (KJV)]. Excessive and eager desire to get or have. A desire for more than one needs or deserves, as of food, drink, wealth, or power. It is greediness. Stresses lack of restraint and often of discrimination in desire. An unmixed evil; Christians are to be on guard against (Luke 12:15). Because desire for wealth or possessions takes first place or precedence in the greedy person’s heart, greed is equated with idolatry (Colossians 3:5). Therefore, church leaders must “not [be] greedy for money, but eager to serve” (1 Peter 5:2). In essence, “greed” defines a person’s character. The person motivated by love for God will sacrifice possessions to serve others. The person motivated by love for self will sacrifice others—and God—to possess things. Jesus warned against all types of greed (covetousness). Jesus used pleonexia in Luke 12:15; translated by KJV as ‘covetousness’ and in the Revised KJNT as ‘greed’. In fact, many if not most of the modern translations use ‘greed’ to replace ‘covetousness’ throughout the NT. G4124 πλεονεξία pleonexia (ple-o-ne-xiy’-a) n. 1. avarice. 2. (by implication) fraudulency, extortion. 3. desire for advantage. 4. greed. The word greedy is used twice in the KJV (NT); 1 Timothy 3:3 and 8. Both times it comes from the Greek word aischrokerdes. G146 αἰσχροκερδής aischrokerdes (ai-schro-ker-d̮ees’) adj. 1. characterized by sordid, disgraceful gain. 2. of disgraceful gain. Acquisitive – A strong selfish desire to get and own material things. Avarice – Extreme desire to have or get money; extravagant desire to gain and hoard wealth; covetousness; greediness or insatiable (excessive) desire of gain; cupidity; also, in a figurative sense, an excessive desire for some benefit or advantage. Covetous – Excessive desire to have something, mainly material things that someone else has. Cupidity – Unrestrained greed for wealth or power; avarice. Passionate carnal desire; sexual love. Desire – To wish for the possession and enjoyment of, with earnestness; to long for; to covet; as, to desire wealth. Gluttony – The act or habit of eating too much or having a great capacity for something; greedy. Selfish – Putting yourself first with little or no regard for others; self-seeking. Caring or concerned only for oneself; self-centered. Rapacity – The quality, act, or practice of being excessively greedy. Outrageous greediness of gain. Greed can lead to crime and ultimately death (Proverbs 1:17-19). Jude warned us to be aware of those (Jude 1:4 and 1:8) who follow their own ungodly desires (Jude 1:18). He states in Jude 1:11 “Woe unto them! for they have gone in the way of Cain, and ran greedily after the error of Balaam for reward, and perished in the gainsaying of Core” (KJV). “Ran greedily after the error of Balaam for reward”? The Expanded Bible “…and for money [because of greed; for wages] they have given themselves [poured themselves out] to doing the wrong [error] that Balaam did (EXB). I warn you to know the Scriptures for yourself and avoid every form of greed. Greed is a bottomless pit which exhausts the person in an endless effort to satisfy the need without ever reaching satisfaction. —Erich Fromm (1900–1980), American psychologist. Escape from Freedom (1941) 2. You are God’s people, so don’t let it be said that any of you are greedy. Do as God does. After all, you are his dear children. 2 Let love be your guide. Christ loved us and offered his life for us as a sacrifice that pleases God. 3 You are God’s people, so don’t let it be said that any of you are immoral or indecent or greedy. 4 Don’t use dirty or foolish or filthy words. Instead, say how thankful you are. Greed is a sin and because of greed, false teachers/preachers will tell you lies to get your money. Do not be deceived because of the size of their congregation or their supporters. Peter warned us about greedy preachers, aka ‘false teachers’. In the past there were false prophets among God’s people. It is the same now. You will have some false teachers in your group. They will teach things that are wrong—ideas that will cause people to be lost. And they will teach in a way that will be hard for you to see that they are wrong. They will even refuse to follow the Master who bought their freedom. And so they will quickly destroy themselves. 2 Many people will follow them in the morally wrong things they do. And because of them, others will say bad things about the way of truth we follow. 3 These false teachers only want your money. So they will use you by telling you things that are not true. But the judgment against these false teachers has been ready for a long time. And they will not escape God who will destroy them” [2 Peter 2:1-3 (ERV)]. Feel free to compare this with your preferred Bible translation. Know that the word covetousness (verse 3) in the KJV and NKJV is the Greek πλεονεξία pleonexia meaning ‘greediness (desire to have more)’. For this reason I left you in Crete, that you should set in order the things that remained, and appoint elders in every city, as I directed you. 6 Elders must be blameless, the husband of one wife, whose children believe and are not accused of being profligate or unruly. 7 For an overseer must be blameless, as the steward of God; not self-willed, not easily angered, not given to wine, not violent, not greedy for gain (money); 8 But a lover of hospitality, a lover of good, sensible, just, holy, self-controlled; 9 Holding fast the faithful word as he has been taught, that he may be able by sound doctrine both to exhort and to refute those who oppose it [Titus 1:5-9 (RKJNT)]. I hope your answer to this question is NO! You can control your desires with the self-control given by the Holy Spirit. Your loving Father knew what you/we needed…thank you Jesus! Since they thought it foolish to acknowledge God, he abandoned them to their foolish thinking and let them do things that should never be done. 29 Their lives became full of every kind of wickedness, sin, greed, hate, envy, murder, quarreling, deception, malicious behavior, and gossip. 30 They are backstabbers, haters of God, insolent, proud, and boastful. They invent new ways of sinning, and they disobey their parents. 31 They refuse to understand, break their promises, are heartless, and have no mercy. 32 They know God’s justice requires that those who do these things deserve to die, yet they do them anyway. Worse yet, they encourage others to do them, too [Romans 1:28-32 (NLT)]. “God is angry. He has shown it from heaven. He is angry because of all the bad and wrong things people do. These people hold back God’s truth by the wrong things they do.” That statement is from Romans 1:18 (WE). “Do you need reminding that the unjust have no share in the blessings of the kingdom of God? Do not be misled. A lot of people stand to inherit nothing of God’s coming kingdom, including those whose lives are defined by sexual immorality, idolatry, adultery, sexual deviancy, theft, greed, drunkenness, slander, and swindling” [1 Corinthians 6:9-10 (The Voice)]. Yes, greed, covetousness and many things that people do are sinful. So I leave you with this final thought from Hebrews 13:5 in the World English Bible. “Be free from the love of money, content with such things as you have, for he has said, “I will in no way leave you, neither will I in any way forsake you” (WEB). Ephesians 5:1-7 (5); 2 Peter 2:1-3; Titus 1:5-9 (7); Colossians 3:1-11 (5). Luke 12:13-21 (15); 1 Peter 5:1-4 (2); Proverbs 1:8-19 (17-19); Ephesians 4:17-24 (19); Jude 1:3-19 (4, 8, 11, and 18). 2 Peter 2:12-17 (14-16); Romans 1:18-32 (18, 29, and 32); 1 Corinthians 6:1-11 (9-10). Jeremiah 22:11-23; Hebrews 13:1-6; Ecclesiastes 5:10-17; 1 Thessalonians 2:1-12 (5). What is your Spiritual Condition? || Learn to be Content || Prosperity God’s Way || God gave you self-control, learn to use it! 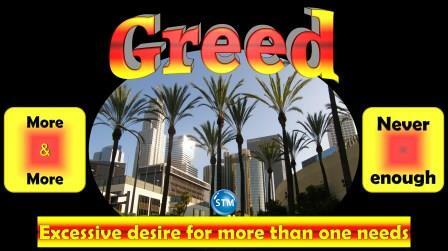 ♥ Question about “greed”: Are you living above your means or desiring more than you need? Scripture quotations marked (CEV) are from the Contemporary English Version Copyright © 1991, 1992, 1995 by American Bible Society, Used by Permission. || (ERV) Taken from the HOLY BIBLE: EASY-TO-READ VERSION © 2001 by World Bible Translation Center, Inc. and used by permission. || (EXB) The Expanded Bible Scripture taken from The Expanded Bible. Copyright ©2011 by Thomas Nelson. Used by permission. All rights reserved. || (GNT) and (TEV) Scripture quotations marked (GNT) are from the Good News Translation in Today’s English Version- Second Edition Copyright © 1992 by American Bible Society. Used by Permission. || (GW) Scripture is taken from GOD’S WORD®, © 1995 God’s Word to the Nations. Used by permission of Baker Publishing Group. Scripture quotations marked (NLT) are taken from the Holy Bible, New Living Translation, copyright ©1996, 2004, 2007, 2013 by Tyndale House Foundation. Used by permission of Tyndale House Publishers, Inc., Carol Stream, Illinois 60188. All rights reserved. || (The Voice) The Voice Scripture taken from The Voice™. Copyright © 2008 by Ecclesia Bible Society. Used by permission. All rights reserved. || (WE) Taken from THE JESUS BOOK – The Bible in Worldwide English. Copyright SOON Educational Publications, Derby DE65 6BN, UK. Used by permission. Greedy people make things their god! Jesus warned against this. So, make it a priority to understand greed; this study can help…? Ephesians 5:3-5 But there must be no sexual sin among you. There must not be any kind of evil or selfishly wanting more and more, because such things are not right for God’s holy people. 4 Also, there must be no evil talk among you. Don’t say things that are foolish or filthy. These are not for you. But you should be giving thanks to God. 5 You can be sure of this: No one will have a place in the kingdom of Christ and of God if that person commits sexual sins, or does evil things, or is a person who selfishly wants more and more. A greedy person like that is serving a false god. Improved to work/look better on your device ? ? ?